Do you want more attention for your social media ads? The way you design your ad impacts how much attention it gets with social media. In this article you’ll discover what the brain pays attention to and tactics for holding that attention. Each second, your senses are bombarded by over two billion bits of data. The only thing that keeps your brain from being overwhelmed is the reticular activating system[RAS]. This system works like a filter, deciding what data should be passed on to your brain for processing and what should be ignored. In other words, it decides what you pay attention to. 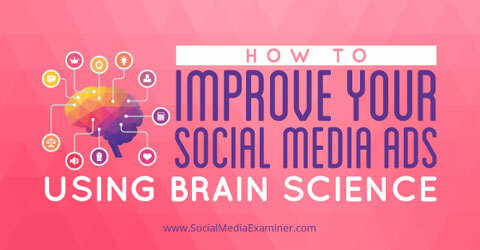 Find out how to improve your social media ads using brain science. Modern advances in neurology and psychology have unlocked some of the key attention triggers that stand out and are picked up by your RAS. These insights hold powerful implications for marketers looking to grab their audience’s attention. Below I highlight several of those triggers. Attraction to motion was programmed into humans over thousands of years. In our species’ sub-Saharan days in Africa, we were always on the lookout for predators or for our next meal. Today we don’t have to dodge danger or track down our next meal, but motion is still a powerful way to capture attention. There are a few ways you can take advantage of that in your social media ads. I would bet that as you scroll down this page, the GIF below is the first place your eyes move to. Why? Because GIFs and videos tap directly into your RAS and pull your attention to them. GIFs are easy to make and draw the eye away from static images. Google+, Tumblr and Twitter all allow you to use GIFs in ads. I suggest taking the time to create animated GIFs for your most important ads in order to pull the user’s attention to you. To illustrate how this principle works with video, go to Facebook and scroll through your news feed. Notice where you focus your attention. There’s a good chance you immediately look at the autoplay videos. Take advantage of that natural reflex and record an Instagram video or Vine to complement your Facebook ads. 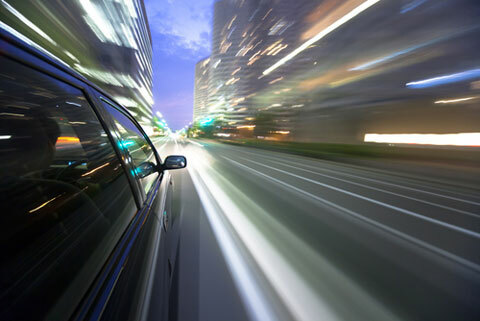 If you want to use a social platform that doesn’t support videos or GIFs, there’s another, trickier way to add motion to your campaigns: Use images that show something moving (like the car below). Catch attention by sharing posts with photos that show motion. Image: Shutterstock. Pictures that show motion (without actually moving) activate mirror neurons that trigger parts of the brain to react as if the event is actually happening. The marketing takeaway is that when you aren’t able to actually use anything that produces motion like a video or GIF, images that depict motion can also help catch your audience’s attention. It’s likely you’ve seen this motion tactic on a blog: As you scroll down a page, certain elements animate. These animated elements could be anything—a spinning graph, a jumping button, a sliding ad, etc. You can see an example on the AddThis blog. When you’re on their site, scroll down and pay attention to where your eyes move. You’ll likely find yourself being drawn to the animated Suggested Content box as it slides in at the bottom right corner. You can use this same tactic as an ad instead of a content suggestion. AddThis uses a popup on their blog to draw attention to related content. It’s easy to overuse motion, so remember that less is more. If there’s too much motion, the brain is overwhelmed and blocks it out. Our brains love a good mystery or puzzle. Integrating elements of ambiguity, mystery or uncertainty into your marketing greatly increases the chances of hooking your audience’s attention. When your brain is presented with something you can’t quite figure out, it locks down your attention so it can focus on how to solve the puzzle. This concept was helpful back when we were trying to figure out how to crack open coconuts for food. One practical application for marketers is creating a mystery that draws the audience inand the only way they can solve the mystery is to click on your ad. Another option is to create anticipation. Audi does a phenomenal job of implementing the mystery principle in this teaser video for a car they’re unveiling at the 2015 auto show. By creating hype and anticipation, Audi enthusiasts are on the edge of their seats and looking forward to the full unveiling of this concept car. Our brains expect to see certain objects in a particular context. When those objects are out of context, the brain has to work to decipher the image. For example, how the mind perceives blank space is a powerful weapon for winning attention. Objects or pictures that are incomplete in the traditional sense make the viewer’s brain work to understand them. Or you can take two common items the brain is familiar with and mix them in an unusual way. This cognitive dissonance intrigues the brain and attracts the user. 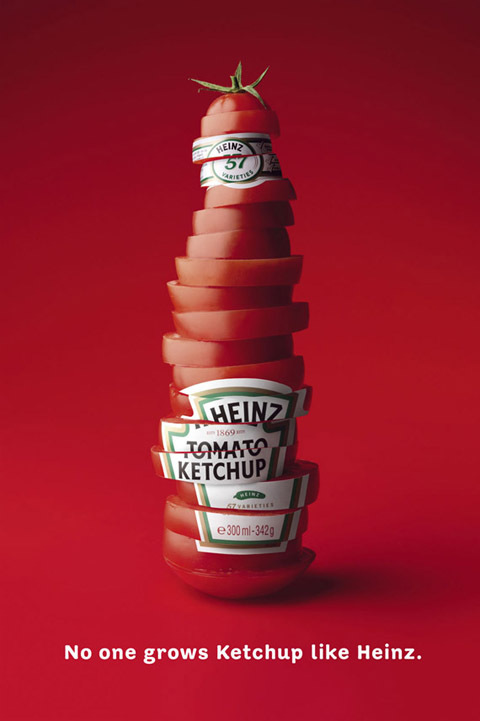 Below, Heinz 57 takes two things your brain is used to seeing individually—tomatoes and a ketchup bottle—and integrates them in a way that makes your brain question what you’re seeing. Make your audience do a double-take. You may be saying, “Luke, we don’t want the viewer to have to work at all!” As long as you make the image easy for the brain to solve, the puzzle actually increases the chance of your capturing and holding the viewer’s attention. Our brains are naturally attracted to faces. You can take advantage of that by building ambiguity into what emotions your audience is experiencing. The makeup and fashion industries do this particularly well. For example, look at an advertisement for Sephora, M.A.C., Avon, etc.—there’s a reason their models have a neutral facial expression. A neutral expression has a certain level of ambiguity and causes the viewer to interpret what the model is thinking or feeling. Something as simple as facial expression can draw your audience in. However, if you provide too much ambiguity and make your image too difficult to decipher, the brain becomes frustrated and the viewer loses interest. As you develop your ads, I suggest keeping them at a level that a 6-year-old can figure out. This level of simplicity keeps the element just tricky enough to grab attention, but not too tricky that the viewer loses focus. Plus, when the audience figures it out, they’ll get a little shot of dopamine (a chemical in the brain that’s released to reward an achievement), which in turn makes them feel good about completing the task. When developing your social advertisements, think about the people you’re targeting. Dig deep to find something that’s dear to their hearts and that they’re familiar with—perhaps a family member or friend, home city or favorite sports team. The high-end hipster brand, Betabrand, uses familiarity in their social media advertising via campaigns on their website. 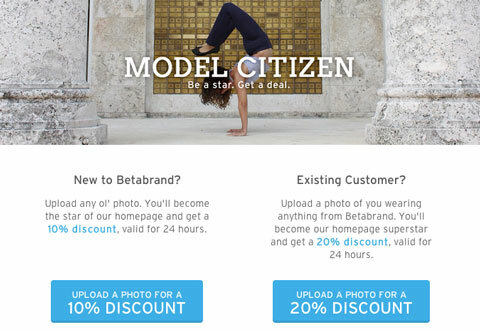 On their website, Betabrand offers customers a 10% to 20% discount if they submit pictures of themselves wearing Betabrand clothing. The catch is that customers must log in with their Facebook profile before they load a picture. Betabrand encourages customers to connect on Facebook. The company takes the customer’s uploaded picture and uses it in a Facebook social media ad that targets the customer’s friends and followers. As the user’s friends scroll down their news feed, they’ll see a picture of their good friend and their attention immediately focuses on that image. Using a photo of someone’s friend to advertise? Talk about brilliant product placement! There’s no doubt the ability to capture and hold attention is a prized skill for marketers. Marketers who understand how the brain works can effectively use that hardwiring to capture attention.